To better understand gum disease let’s take a look at the anatomical and histological structures of teeth as well as the gum tissue and bone that surrounds the teeth. We don’t need an in-depth, specialized education. We just need to have a basic, generalized understanding of the oral anatomy and histology. As humans, we all use our teeth to bite and chew food. They are the first step to digestive system. The front teeth (incisors and canines) are meant to cut and tear food, while the back teeth (molars) are meant to grind and mash food. The food is then propelled to the back of the mouth by the tongue, and swallowed. If you’re missing molars, the front teeth are then given the double duty of cutting and mashing. Mashing food with your front teeth is not good, as it speeds up bone loss around those teeth. That’s why is is always recommended that any time a tooth is missing, it should be replaced right away. The human tooth consists of a crown and a root. The crown is typically the part of the tooth above the gums that you see when you look at your teeth. It consists of the outermost layer of enamel. Enamel is the hardest and most mineralized substance in the human body. Just beneath the enamel, and comprising the bulk of the tooth, is a hard, dense substance called dentin. 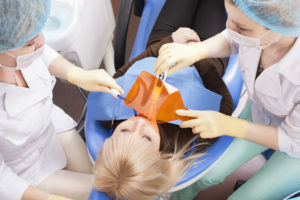 Beneath the dentin, in the center of the tooth, lies an area comprised of living cells, connective tissue, blood vessels and nerves called the pulp. The root of the tooth is typically not visible, as it is below the gums and, therefore, below the bone. The region of the tooth where the crown meets the root is called the neck of the tooth. In a healthy mouth, your gum tissues are tight around the necks of the teeth. Surrounding the roots of each tooth is the alveolar bone of the maxilla (upper jaw) and mandible (lower jaw). In a healthy mouth, bone levels come up high around the necks of the teeth and the bone level is even throughout the entire mouth. Between your teeth and gums is a small valley called the gingival sulcus. It extends from the top of the gingiva (known as the gingival crest) to the area where the periodontal ligaments attach it to the root of the tooth, and it travels all the way around the tooth. Prior to cleaning your teeth, your dental hygienist should measure 6 points around each tooth to see how deep the sulcus is. 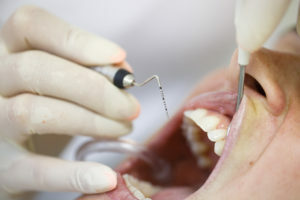 The depth of the sulcus is recorded by using a periodontal probe. Ideally, the depth of the sulcus should measure 3 mm, and it should be probed and recorded every 12 months. If it measures deeper than 3 mm, we no longer call it a sulcus. At 4 mm in depth, we now refer to it as a periodontal pocket. At 6 mm in depth, it is now twice as deep as it ought to be, and we refer to it as a deep pocket. Whereas shallow pockets are bad, deep pockets are really bad. Your goal with healthy gums is to have no measurements above 3 mm. You also want them to not bleed or exude pus when you clean them or when the measurements are recorded. The final phenomenon that we want to focus on in our crash course of dental anatomy and histology is a saliva-like fluid known as gingival crevicular fluid. Gingival crevicular fluid flows from the gingival sulcus or periodontal pocket, and is believed by some authorities to be an inflammatory exudate and by others (like me) to be a cleansing material to flush debris out of the sulcus/pocket. In the case of healthy gingiva, the flow rate of gingival crevicular fluid is minimal-to-absent and it increases dramatically as the gingival tissues become more irritated and inflamed. Healthy gums don’t bleed when they are probed or when your teeth are professionally cleaned. Measurements of 1 to 3 mm are good. Measurements of 4 to 5 mm are bad. Measurements of 6 mm and above are really bad. The rate of crevicular flow increases as the gingival tissues become more irritated and inflamed. I ultimately realized that I needed to get all of our patients on the same page with their homecare. The only way for all patients to achieve excellent results is for ALL patients to have excellent home care after we have done an excellent job of removing the tartar for them. In my quest for excellence, I discovered a patented oral appliance that delivers medication directly to the source of periodontal infections – the base of the periodontal pocket. In March of 2008, I was attending a 4-day symposium just outside of Las Vegas. Between courses, participants were encouraged to visit the various vendors outside the seminar rooms. One particular vendor caught my eye, as it dealt with periodontal disease. Unfortunately, there was nobody in the booth and no additional information on the company. I asked the vendor in the next booth over if he knew anything about this company. He told me that it was “a mouthpiece that treats gum disease”. his lecture, and it was one of the best decisions I have ever made. At first, I was extremely skeptical. My whole demeanor was crossed off. I sat back in my seat with my arms folded and thought to myself, “This is going to be a complete waste of 4 hours”. By the time his lecture was over, I had gone from laid back and crossed off to sitting on the edge of my seat practically jumping up and down with excitement! I admit it… I’m a geek! What he had been saying in that lecture made so much sense to me… killing the anaerobic bacteria with oxygen. He was using hydrogen peroxide as the primary antimicrobial agent to oxidize the bacteria. I instantly remembered back to a decade before when I was irrigating with Superoxol to aid me in the technique of hemostasis with the patented laser procedure. I recalled how pink and healthy the gingival tissues looked at the postoperative evaluations. I became very excited that the inventor of this oral appliance was also having great success with hydrogen peroxide. However; what really sold me were his results… his results were better than mine. Whenever someone is better than me at something, I pay attention to what they have to say! I flew home from the symposium on Sunday evening, and the first thing I did on Monday morning was roll my laser into the closet. There it sat for the next 3 months, collecting dust, as I dove headfirst into this revolutionary, non-invasive treatment. I followed the suggested flowcharts for this new “mouthpiece” treatment, Over time I came to realize that while this new treatment was effective, it was very time- consuming and nearly impossible for patients to adhere to the recommended homecare. About 3 months after using this new treatment, a patient told me that he wasn’t going to do the treatment anymore because it was consuming his life. At this point, he had been in treatment with the oral appliance for over 6 weeks, wearing them every 3 hours for 15 minutes. His deepest pocket was 15mm when he started. Now, 6 weeks later, the 15mm pocket had decreased to 12mm deep. He explained to me that as an attorney, most of his day revolved around being in the courtroom, and he said to me, “I’m in court all day. I can’t keep calling for a recess to put these damn things in my mouth. You need to do something about this.”. I said, “No problem. Let’s numb up the site and I will use my laser on your gum tissue”. A few minutes later he was numb, and shortly after that I had ablated the diseased epithelial gum tissue with my laser, root planed his tooth and he was off to court. One week later he returned for a postoperative visit. His gums were completely healed and you couldn’t even tell that he’d had the laser microsurgery. When I measured the pocket, it had shrunk from 12mm to 6mm in one week! as little as possible in obtaining those amazing results. At this time, I began to experiment with variations of the different treatment modalities I had learned over the previous decade. I started using a combination treatment that incorporated the traditional methods in conjunction with the new methods until I had perfected what is known today as Therapeutic Laser Care for Gums, or TLC 4 Gums, or simply TLC. I developed a simple classification system for the various stages of this gum condition based solely on pocket depth and bleeding. Over much of the last century, researchers and clinicians have struggled to agree on a universal classification system of the various forms of this condition. This has resulted in frequent changes and revisions that, quite frankly, seem to cause more confusion than guidance. The one thing we can all agree on is this: The deeper the periodontal pocket and the more the gums bleed; the more severe the condition. That’s why I based my classification system on pocket depth and bleeding. In December of 2008, I was sitting in my office evaluating the office results of 2008 and mapping my goals for 2009. It was 8:00 PM on a Friday and night and the phone rang. My first thought was, “Don’t answer that. You don’t want the person on the other side of that line to know that you’re in your office at 8 o’clock on a Friday night because you have no life!”. However; curiosity got the best of me and I looked at the caller I.D. I quickly realized that the person calling me was calling from St. Louis, MO. I thought to myself, “Wait a minute… It’s 10 o’clock on a Friday night in St. Louis… THIS person has no life!”. I answered the phone. On the other end of the phone was the inventor of the patented oral appliance. He asked me what I was doing, and when I asked him for clarification he said, “I was just on your website and I saw the results you’re getting. They’re better than mine! What are you doing?”. My mind immediately raced back to when I was harshly scolded by the two inventors of the patented laser procedure, and the last thing I wanted was to be scolded by this man. I told him, “I’ll tell you what I’m doing, but you have to promise me that you won’t get angry.”. His response was, “Okay, I promise.”. I told him, “I ditched your protocols and I came up with my own.”. His next response took me by surprise. He said, “I want them.”. has its own ‘recipe’ that lays out exactly what the clinician needs to do and exactly what the patient needs to do to obtain excellent results.”. She then told me, “We can’t do that.”. I asked her what she meant. She explained, “Our patent is for a medical device only. We can only teach doctors how it works and they have to figure out for themselves how they’re going to incorporate it into their practices. We can’t tell doctors specifically how to use it… but you can!”. That’s when I developed my Perio 101 course that teaches dental offices the TLC protocols. Now Tanya refers dental offices to me so that I can help them be successful in eradicating gum decay from their patient populations. As a clinician, my goal is to help you save your teeth so that you can be healthy and enjoy them for the rest of your life. The number one cause of tooth loss is periodontitis. Naturally, you need to have healthy gums if you’re going to keep your teeth for a lifetime, so my first priority is to help you eliminate pocketing and bleeding. When your gums bleed, bacteria travel into the bloodstream and course throughout your body. Eventually they end up in your major organs. That’s why over the last 20 years or so, you’ve been hearing about how gingivitis and periodontitis are linked to heart disease, diabetes and stroke… just to name a few. These are 3 of the top 5 or 6 (depending upon the year) preventable causes of death in the U.S.
Additionally, I want to help you eliminate pus and tighten up loose teeth. However; since pus and mobility are less common than bleeding and pocketing, this is more of a secondary priority. Gingivitis and periodontitis are extremely prevalent among adult Americans. Treatment for these conditions are simple as removing the tartar and preventing the tartar from reforming. The dental professionals job is to remove the tartar. Your job is to prevent the tartar from reforming on the roots of your teeth. Your job is more difficult than the dental professional’s job. Your job is WAY more important than the dental professional’s job. These conditions have been linked to heart disease, diabetes and stroke. These conditions will not go away on their own. If you ignore gingivitis and periodontitis, the condition will only worsen, which could eventually lead to tooth-loss. Laser periodontal therapy is less-invasive than traditional surgical pocket reduction. Excellent homecare is probably the most important factor in successful pocket reduction. The patented oral appliance described in this chapter is the most effective homecare method I have witnessed in over 25 years of treating gingivitis and periodontitis. To book a consultation at Arizona Periodontal Laser or to get a copy of the book, contact us today. The following is an excerpt from TLC4Gums founder Dr Gordon Wilson’s new book, “The Secret Techniques to Eliminating Gum Disease without Surgery”. In 1995, I began my professional career in a small family practice in North Phoenix. I quickly learned that gingivitis and periodontitis were much more prevalent than I had imagined they would be. Research has shown that over 80% of adult Americans aged 30 and above have either gingivitis or periodontitis. Gingivitis is an inflammation of the gingival tissues (gums), characterized by redness, swelling and bleeding. It’s the condition that I had when I was able to perform my “tongue-full ‘o blood” trick in college, and again during the war. Gingivitis is the first stage of “gum disease”, and it’s the only stage that is 100% reversible, because there has been no bone loss. I was taught in dental school that treating this condition is as simple as: A) remove the tartar, B) prevent the tartar from re-forming. That’s it! The dental professional’s job is to remove the tartar. Your job is to prevent it from re-forming. Coincidentally, your job is way more difficult, and your job is far more important than the dental professional’s job. Periodontitis, on the other hand, is an inflammation and infection of the bone, connective tissue and gum surrounding and supporting the teeth. It’s characterized by redness and swelling in addition to bleeding, the possible presence of pus and the gradual loss of bone and the tissues that support the teeth. You’ve probably heard that once bone is lost, it can never grow back. This is what I was taught in dental school, and it’s simply not true. Over the years, I have become very adept at regenerating bone that has been lost due to periodontitis. Gingivitis is more commonly known among the general population than periodontitis, so many people think that gingivitis is worse than periodontitis. The opposite is true. Periodontitis is actually worse than gingivitis. When I first began practicing dentistry, I did exactly what I was taught to do in dental school. Unfortunately, it’s the same regimen that is still being taught in dental schools today. This inevitably meant that they would require surgical pocket reduction. This arduous surgical procedure can be performed by a general dentist, but usually the general dentist may choose to refer the patient to a gum specialist called a periodontist. This led to angry patients, and I don’t blame them. I would have been angry too! My patients wanted to know why they still had pocketing and bleeding after they had just spent so much money to have this condition treated with scaling and root planing. After all, I told them that they needed this treatment. They heeded my advice, yet they still had the condition after we had treated it for them. I lost so many patients during my first few years of practice. Some patients would leave my practice out of anger because their gums were still infected with periodontitis after spending so much money on scaling and root planing. They thought that treating periodontitis was like treating a cavity… once it’s been treated, the problem’s over. They didn’t realize just how important their homecare is, and I didn’t realize how ineffective flossing is. If you’ve ever watched the movie, “Rudy”… that was pretty much my story, just with a different football team. Then reality set in. With the Army Reserve only paying for 50% of my tuition, and student loans picking up the other 50% of tuition, there were other expenses to consider… room and board, car expenses, food, etc. In September of 1989, I made the hardest decision of my young life. I quit the team to take a job. I began working in a dental lab, making teeth. I really enjoyed it and I learned quite a bit about teeth. Prior to that, my only work experience had been manual labor sunup until sundown on the farm and working construction in college before playing football. Working indoors was a really nice change of pace! My schedule was murderous, though. I would wake up at 3AM in order to get to work by 3:30AM. I would work from 3:30 until 7:30, then I would attend classes from 8 until noon. At noon, I would go home, grab a bite to eat and take a short nap before heading back to classes from 2PM until 4:30PM. Then, it was back to the dental lab from 5PM until about 8:30PM. During this time, I developed a wicked case of gingivitis, and my gums began to bleed like crazy. I was doing everything that I’d been taught to do my whole life… brush after every meal and floss twice a day. I even started flossing 3 and 4 times a day and brushing my teeth while in the car driving to and from work and school. I started using mouthwashes and even brushing with a European tooth powder that I’d found in a local health food store. I noticed that my teeth were definitely whiter but my gums were still bleeding. Nothing helped. I could place my tongue against the roof of my mouth and my upper teeth, create suction and my entire tongue would be filled with blood. You know how smooth your teeth feel after you’ve just had them professionally cleaned? How would you like them to feel that way 7 days a week, 365 days a year? If you follow the instructions in this book, your teeth will feel like you’ve just had a professional cleaning every single day of your life, while simultaneously avoiding costly and painful gum surgery! Have you ever been told that you have “gum disease”? Do your gums bleed when you brush and floss? Have you noticed a foul odor emanating from your mouth? If so, you’re not alone. Research over the years has shown that over 80% of adult Americans suffer from some form of this so-called “disease”. It can range from simple gum inflammation to serious gum and bone damage that can eventually lead to tooth loss. In fact, it is the number one cause of tooth loss! However, with effective therapy, this condition can easily be reversed, and you can keep your teeth for a lifetime, and improve your overall health! My name is Dr. Gordon Wilson. I am a general dentist and I have been practicing dentistry in Phoenix Arizona since 1995. When I began my dental career, I didn’t expect to become an authority on the treatment of “gum disease”. I actually wanted to be a cosmetic dentist. I wanted to give every patient a bright, beautiful, Hollywood smile. Nevertheless; here I am today with 5 patent-pending protocols for treating each stage of gingival health non-invasively and minimally-invasively… no scalpels… no stitches… no painful or costly gum surgery!